A group of residents of Meadowmont Village gathered at the Little Creek Trailhead on January 15 to begin participation in Clean Jordan Lake's Adopt-A-Feeder Stream Program. Bolin Creek and Booker Creek join together in Chapel Hill to form Little Creek that flows along the northern edge of Meadowmont Village before turning south to Jordan Lake. 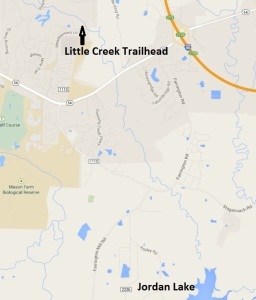 The Little Creek trail runs along low lying land managed by the U.S. Army Corps of Engineers at Jordan Lake. Meadowmont resident , Eric Teagarden, has led an effort to improve the trail. He said "When I heard about Clean Jordan Lake's new program, I knew this would be a good match for us. We see lots of trash washed down to the creek after rainfalls. " The Little Creek adoption is the second in Clean Jordan Lake's new initiative to stop trash from reaching the lake. The first adoption was along the Town of Apex's Beaver Creek Greenway. Our long-term goal is trash prevention in the entire watershed of Jordan Lake. We soon hope to move even further in that direction with a public education campaign to sensitize watershed citizens to the fact anything thrown on the ground will eventually be flushed to the lake by rainfall events. Bill Ferrell, manager of Meadowmont, was on hand for installation of the adoption sign and noted "this should make our residents more aware of their connection to Jordan Lake." Afterwards, the Meadowmont volunteers forged into the woodlands for their first cleanup. They filled 14 trash bags full of glass and plastic bottles, assorted playground balls, car parts, and other junk. Teagarden added "We plan to tackle another area of the trail on February 8th and probably fill 20-30 more bags." We're pleased to see the growth in our Adopt-A-Shoreline Program, the forerunner to the Adopt-A-Feeder Stream Program, as well as the increase in community service days by various groups throughout the year. Since we incorporated Clean Jordan Lake in 2009, over 3,400 volunteers have participated in about 140 cleanups, large and small. They've removed 9,500 bags of trash and an astounding 3,500 tires. We expect to reach a milestone in March-- 10,000 bags of trash removed! Look later to see how we plan to commemorate the occasion. Waco Tribe of Y Princesses and Trail Blazers Return Engagement!